Chakdar, H., Kumar, M., Pandiyan, K., Singh, A., Nanjappan, K., Kashyap, P.L., Srivastava, A.K. (2016). Bacterial xylanases: biology to biotechnology. 3 Biotech, vol. 6: 150. 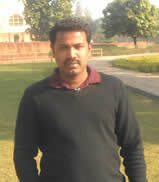 Yadav, A.K., Manna, S., Pandiyan, K., Singh, A., Kumar, M., Chakdar, H., Kashyap, P.L., Srivastava, A.K. (2016). Isolation and characterization of biosurfactant producing Bacillus sp. from diesel fuel-contaminated site. Microbiology, vol. 85(1): 56-62. Pandiyan, K., Tiwari, R., Rana, S., Arora, A., Singh, S., Saxena, A.K., Nain, L. (2014). Comparative efficiency of different pretreatment methods on enzymatic digestibility of Parthenium sp. World Journal of Microbiology and Biotechnology 30 (1): 55-64. Pandiyan, K., Tiwari, R., Singh, S., Nain, P.K.S., Rana, S., Arora, A., Singh, S.B., Nain, L. (2014). Optimization of enzymatic saccharification alkali pretreated Parthenium sp. using response surface methodology. Enzyme Research, Article ID 764898.